NPL Vita Pack are comprehensive daily nutrient packs in optimal dosages needed for health and energy. Serious lifters and fitness athletes train hard. Environmental factors, stress, lifestyle and high intense workouts all place demands on the body. Each pack has 6 capsules / 1 softgel, removing the guess work from your micronutrient supplementation giving you optimal dosages needed for health, energy and immunity. Athletes have strict dietary requirements. In addition our modern fast-paced lifestyles may make it challenging to eat all the food containing vitamins and minerals needed. This product provides support for any micronutrient deficiencies. For example each serving has 1041% of your daily requirement for Vitamin B12 which enhances energy. Weight training increases muscle mass, but overtime may affect your joints. Included is a popular blend for joint support and maintenance. Enzymes assist with the breakdown of food so that your body can absorb the nutrients more efficiently helping you reach your goals faster. Lifting weights places stress on your body and may produce free radicals which accelerate the aging process. Every pack contains a high potency of known antioxidants such as Vitamin C, A and E to reduce any free radical damage. 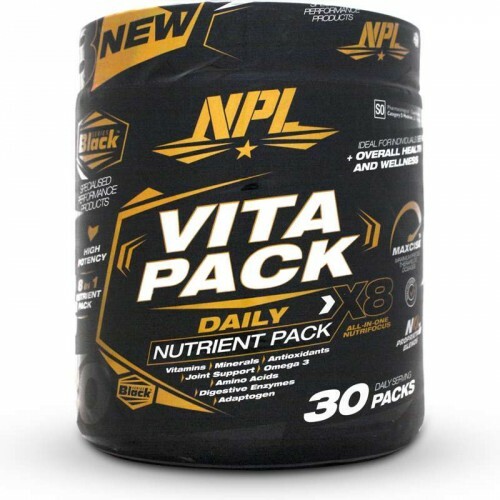 NPL Vita Pack gives comprehensive micronutrient support to athletes and lifters wanting peak performance and wellness. This supplement offers the same high quality as international alternatives but at a fraction of the cost. • One serving is 1 sachet / pack. • Consume contents after breakfast. Not intended for use by persons under the age of 18. If you suffer from a chronic medical condition or are using chronic prescription medication consult your healthcare practitioner before using this product. Do not use if you have any hypersensitivity or allergy to any of the ingredients. Do not use if you are pregnant or breast feeding.